Marie-Antoinette Chouart (1661-1731) was the daughter of the famous explorer and coureur de bois Médard Chouart, sieur des Groseilliers. She acted as godmother on several occasions to local French and Aboriginal children. The first time was on 1 May 1674 in Trois-Rivières, when Marie-Antoinette was only 12 years old. (She turned 13 three weeks later.) She was godmother nine other times, from 1674 to 1717, when she was 56 years old. Marie-Antoinette had five godsons and five goddaughters. All were French, except Louis Ouramanampek, an Aboriginal. Four of five of Marie-Antoinette’s goddaughters were named after her. 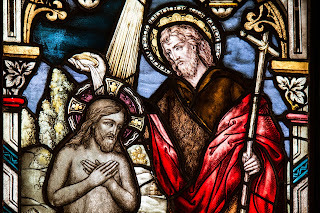 All the godchildren were infants at their baptism. The two exceptions are Marie Antoinette Barabbé in 1674, whose baptism record doesn’t mention her age, although she was likely a newborn or only a few days old. The second exception is Louis Ourmanampek, who was an adult when he received the Sacrament of Baptism in 1674. Marie-Antoinette could write her name. She signed seven of the ten baptism records. 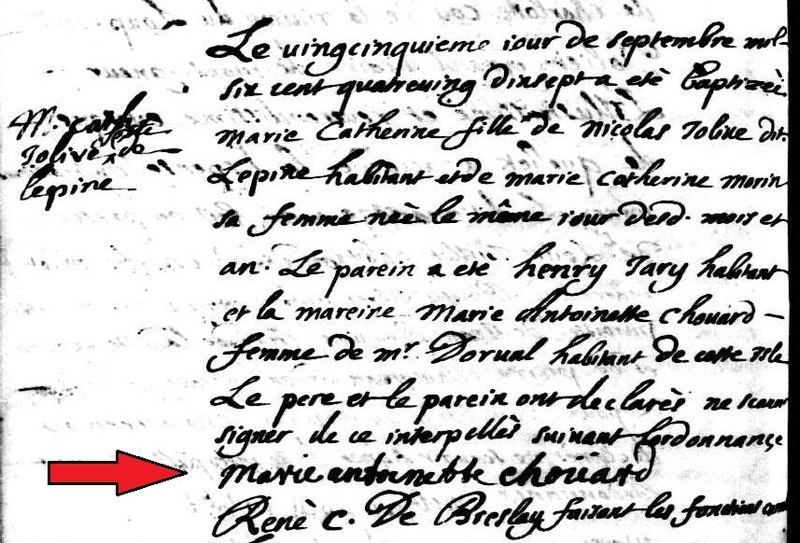 In the example below from 1697, we can see her beautiful, easy-to-read, balanced signature (indicated by the red arrow): “Marie antoinette choüard”. Image credit: CCO Public Domain, Pixabay. 1. “Actes”, database, Programme de recherche en démographie historique (PRDH), (http://www.genealogie.umontreal.ca : accessed 14 August 2009), Adrien Senegal, Baptême no. 87758. 2. “Actes”, database, Programme de recherche en démographie historique (PRDH), (http://www.genealogie.umontreal.ca : accessed 14 August 2009), Marie Antoinette Barabbe, Baptême no. 87762. 3. “Actes”, database, Programme de recherche en démographie historique (PRDH), (http://www.genealogie.umontreal.ca : accessed 14 August 2009), Louis Ouramanampek, Baptême no. 87764. 4. “Actes”, database, Programme de recherche en démographie historique (PRDH), (http://www.genealogie.umontreal.ca : accessed 14 August 2009), Marie Antoinette Verger, Baptême no. 19435. 5. “Actes”, database, Programme de recherche en démographie historique (PRDH), (http://www.genealogie.umontreal.ca : accessed 14 August 2009), Marie Antoinette Lorry, Baptême no. 19451. 6. “Actes”, database, Programme de recherche en démographie historique (PRDH), (http://www.genealogie.umontreal.ca : accessed 14 August 2009), Jean Baptiste Delpesche Belair, Baptême no. 19508. 7. 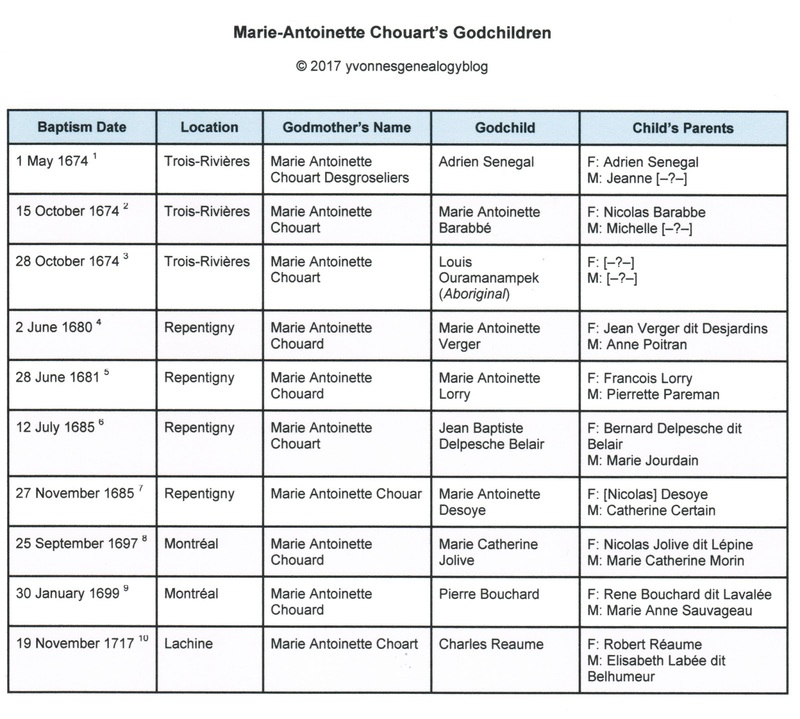 “Actes”, database, Programme de recherche en démographie historique (PRDH), (http://www.genealogie.umontreal.ca : accessed 14 August 2009), Marie Antoinette Desoye, Baptême no. 19512. 8. 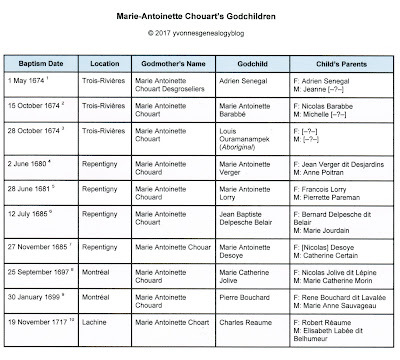 “Actes”, database, Programme de recherche en démographie historique (PRDH), (http://www.genealogie.umontreal.ca : accessed 14 August 2009), Marie Catherine Jolive, Baptême no. 41812. 9. “Actes”, database, Programme de recherche en démographie historique (PRDH), (http://www.genealogie.umontreal.ca : accessed 14 August 2009), Pierre Bouchard, Baptême no. 43009. 10. “Actes”, database, Programme de recherche en démographie historique (PRDH), (http://www.genealogie.umontreal.ca : accessed 14 August 2009), Charles Reaume, Baptême no. 13993. 11. Notre-Dame (Montréal, Quebec), parish register, 1695-1699, no page no., no entry no. (1697), Marie Jolive baptism, 25 September 1697; Notre-Dame parish; digital image, “Le LAFRANCE”, Généalogie Québec (http://www.genealogiequebec.com : accessed 17 May 2017).